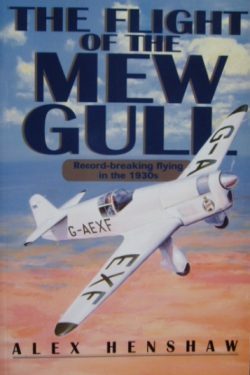 Airlife Publishing Ltd Edition 1998. 269 pages and well illustrated with photographs. Mint condition card cover book. New and unread. A classic story of flying in the 1930s. 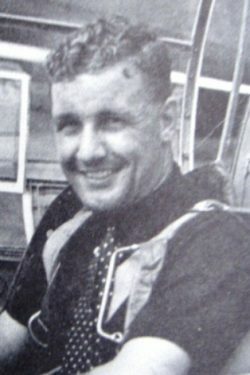 The King’s Cup Air Races, long distance flights over Europe and finally the amazing solo flight to Cape Town and back in February 1939, a record which has only recently been beaten. This feat of navigation, airmanship and endurance ranks as one of man’s greatest flights – 12754 miles over desert, sea and jungle in a single engine light aircraft. Alex Henshaw tells his story in a vivid style that puts you at the heart of all his battles and adventures. 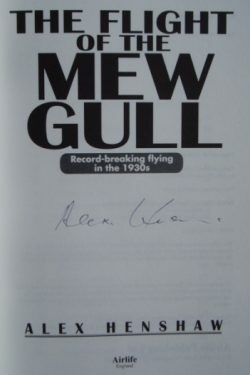 A signed copy of one of the great aviation books.